The airline says it will start serving the coffee on a flight from Toronto to Calgary and expand service across its fleet. 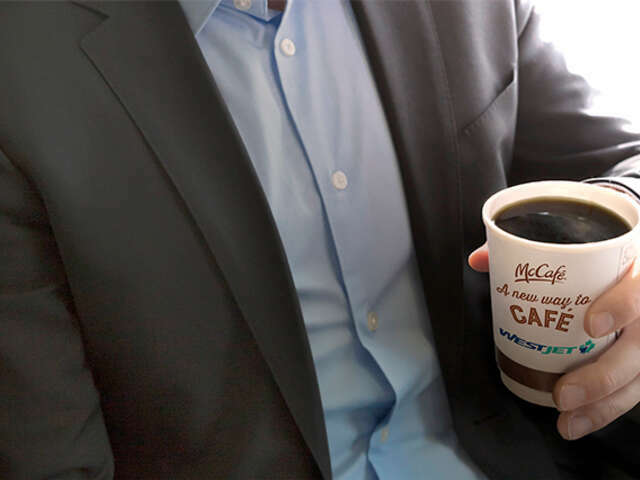 WestJet has signed a deal to serve McDonald’s coffee aboard its flights. The airline says it will start serving the coffee on a flight from Toronto to Calgary and expand service across its fleet. By December 1st WestJet says it also plans to offer McDonald’s coffee across its fleet of 737NG and 767NG aircraft with its regional airline, WestJet Encore to follow. McDonald’s has been working to improve its coffee in recent years with its McCafé brand. The deal is similar to other arrangements airlines have struck with coffee companies. With more than 140 aircraft, the partnership will service approximately 30,000 cups of McCafé Premium Roast Coffee every day. Coffee on board WestJet aircraft will have the same popular on-cup rewards collector card and peelable sticker, redeemable on completion at participating Canadian McDonald's restaurants. Complimentary beverages are available on most WestJet flights and may include water, soft drinks, juice, tea, and McCafé Premium Roast Coffee. I REALLY appreciate all of Michelle's help and expertise!! UNIGLOBE LGI Travel is by far the best travel agency around. They’re incredibly friendly, fast, and always seem to know just what we’re looking for. Michelle has helped us book our group vacations to warm destinations for the past 5 years. Michelle has been awesome to work with. I have recommended Michelle's Travel Agent servies to many of the folks in my office. We are never worried about being disappointed when Michelle K is looking after our vacation plans! I like working with Michelle because she makes a stressful event such as wedding planning fun. I have had nothing but positive experiences and have always found Nicole to be extremely efficient and enjoyable to deal with! The level of service provided by the staff is exceptional – everyone is always friendly, polite, professional, and prompt.